The Bonaparte Basin is a frontier basin in the north of the Northern Territory with a proven hydrocarbon system. Several large gas fields have been discovered offshore (undeveloped Contingent Resources of 2.7 Tcf in Petrel, Tern and Frigate) and the producing Black Tip field (2P 933 Bcf) supplies gas to Darwin. The Bonaparte Basin covers an area of ~270,000 km2, of which around 20,000 km2 is onshore. The basin is structurally complex and consists of several platform areas and sub-basins. 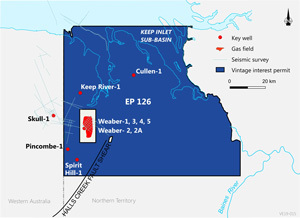 The onshore Weaber Gas Field (RL-1, Advent Energy 100%), and surface bitumen seeps, provide direct evidence of a working petroleum system in the Keep Inlet Sub-Basin. EP 126 represents a low-cost entry with excellent exploration potential. Vintage has executed a Sale and Purchase Agreement with Beach Petroleum (NT) Pty Ltd, dated 31 July 2018, and now has 100% equity in EP 126 for nil cash consideration. 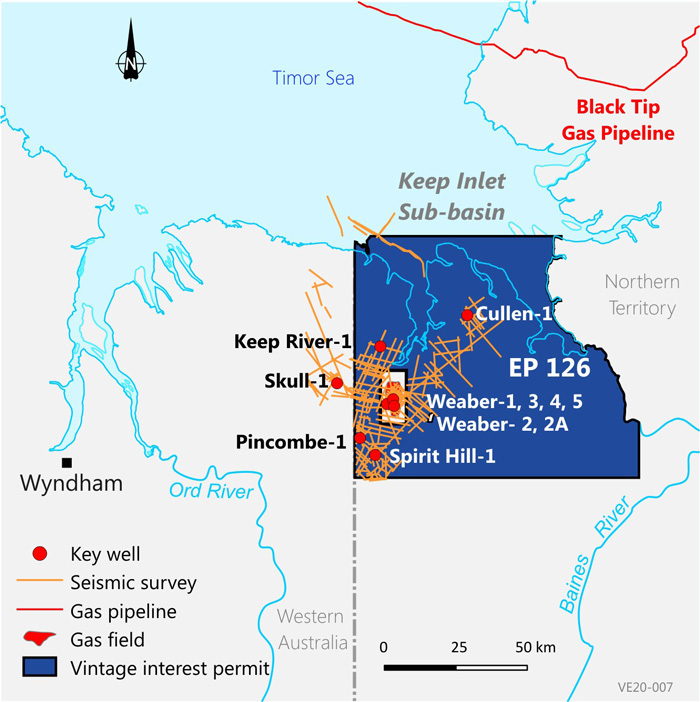 Vintage takes responsibility for the cased and suspended Cullen-1 well which was drilled to a TD of 3,325mKB during 2014. Planning is underway for the testing of multiple possible gas zones in the well. EP 126 is a large permit with an area of 6,716 km2 and provides the Company with a high risk/high reward project that complements the current portfolio. 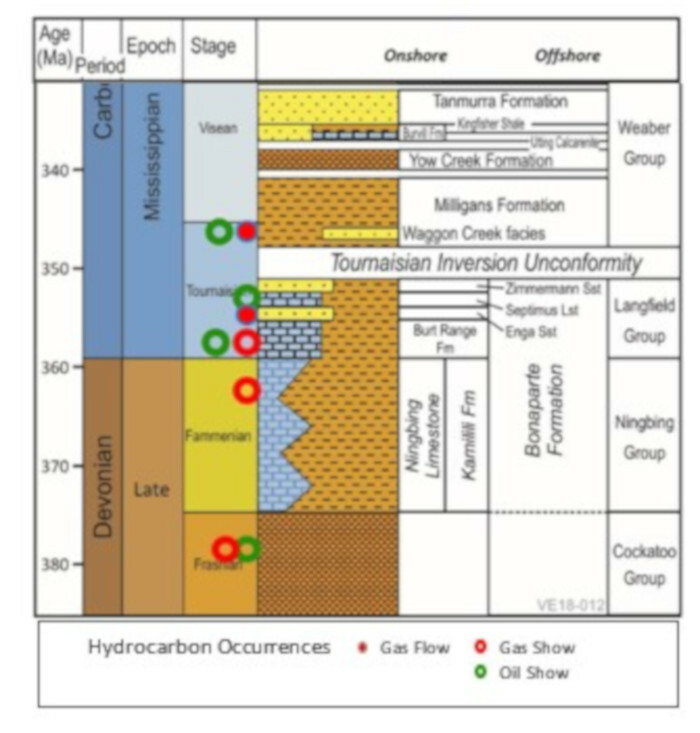 There are multiple play types, with potential for large volumes of gas and oil. 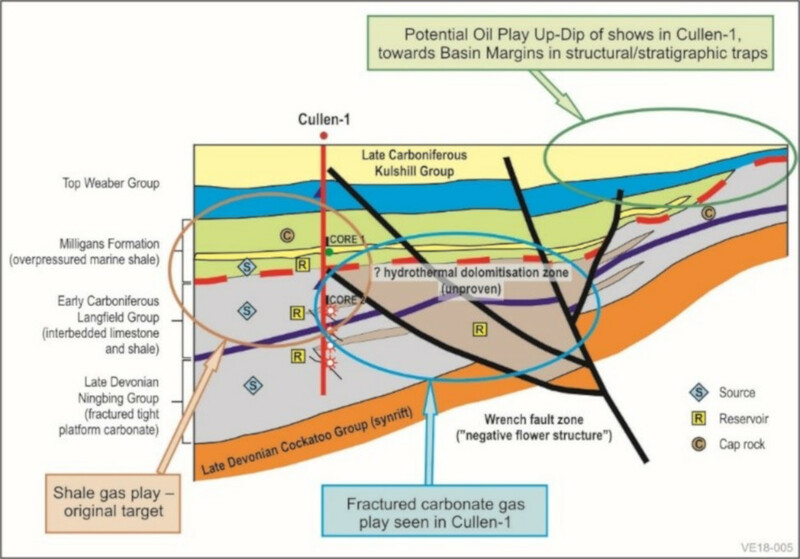 Cullen-1 was drilled in 2014 with both oil and gas shows and was cased and suspended to be available as an option to test. EP 126 is in the later stages of its first term with an expiry date of 14 December 2019, thereafter a renewal into the second term will require a 50% relinquishment. This can be satisfied by surrendering the lesser prospective portions of the permit. The NT Government has recently announced, as part of lifting the moratorium on hydraulic fracturing, that it will be introducing legislation specifying (amongst other things) exclusion zones in which fracture stimulation will not be permitted. As we do not presently plan to undertake fracture stimulation on EP 126, we do not anticipate any significant impact on our operations in the near term. Vintage looks forward to working with the Northern Territory Government, local industry and the local communities to progress this exciting frontier exploration opportunity. Vintage Energy Ltd has been established to acquire, explore and develop energy assets principally within, but not limited to, Australia, to take advantage of a generally favourable energy pricing outlook. Enter your details to receive updates from Vintage Energy.